Valentine's 2011 are an easy way to help you and your kids celebrate this day with personalized Valentines to give to their friends and classmates. These unique mini-cards would be a simple and enjoyable project to print, cut out and fill in the names. We hope this puts a little fun into your Valentine's Day, and who knows which one you may receive from your secret admirer! 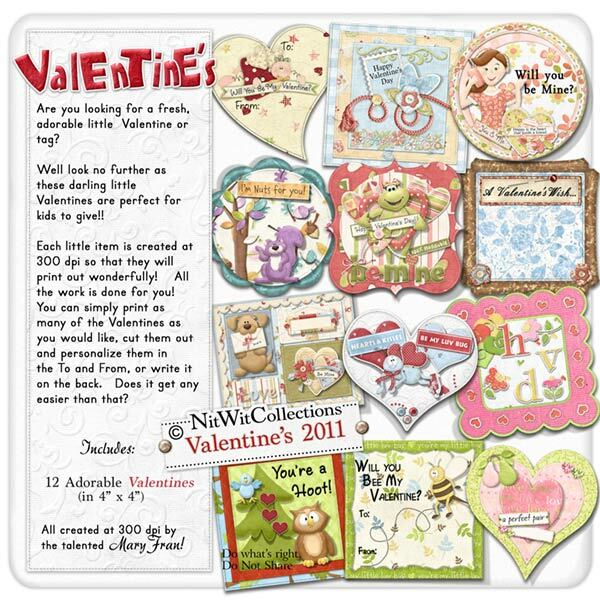 12 Adorable little Valentine's Day mini-Cards created using various themed Collections of mine. Cards are each approximately 4inches by 4inches.